If you see a watermark in Cinemagraph Pro, it's possible that you're still using the Version 2 trial with the latest features. Go to the Account & License window under the Cinemagraph Pro menu or use the keyboard shortcut ⌥⌘A (Option-Command-A) and select Revert to Version 1 Features. In order to activate a license purchased on the online Flixel Store, Cinemagraph Pro for macOS must have been downloaded on flixel.com. You will not be able to activate the license on the Mac App Store version of the app. 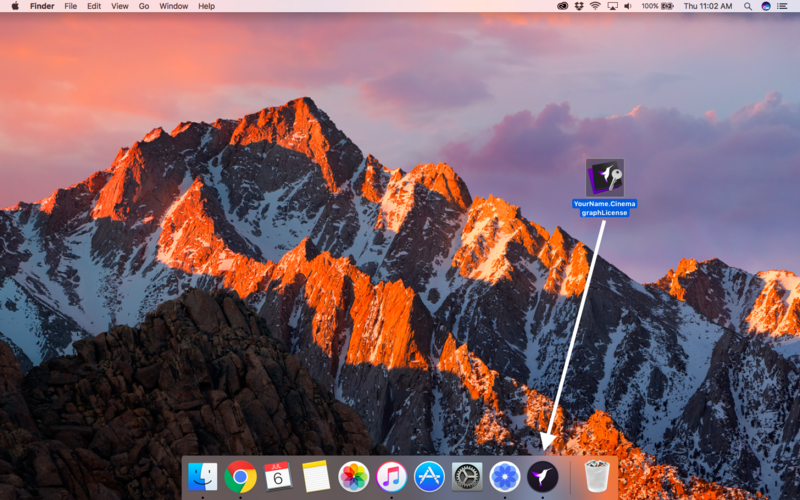 To ensure you're using the correct version of Cinemagraph Pro, delete your current version of the and download this one. Once the correct version has been installed, you can drag your license file onto the application in the dock, as shown below. If you see a watermark in Cinemagraph Pro, it's possible that you're still using the Version 2 trial with the latest features. return to the top of this article to learn how to revert to version 1 features.